The Squire and I went to a meeting last night, and came home about 10 PM. As our headlights swung around the bend in the drive, we startled a great blue who was sleeping in the middle of our back yard. Hard to tell which of us was the most surprised, to tell the truth. The poor bird started to fly away, got tangled in the clothes line, fell back to the ground and stalked off into the dark with as much dignity as he could manage. Blazer likes to chew on his dish. A rawhide bone apparently has nothing on the delicate taste of a well-seasoned plastic bowl. Consequently, the dish resembles a small green colander. This is absolutely something I must remember when I pour milk over his morning kibble. As a result of this minor flood, I staggered over to our local metropolis to purchase a new, sturdier, bowl and pick up some wrapping paper, so I can get a running start on the Christmas gifts, and then to the grocery for a few items Aldi’s doesn’t carry. In the store, I ran into my girlfriend Karen, who came here from a northern European country. I don’t know if they are as enamored with ATMs there as much as we are in America, but she simply has no use for them. She had gone into the bank to deposit a check, and there was not a single teller at any of the windows, so she marched up to the manager and asked him (rather forcefully, if I know her as well as I think I do) to take care of this for her. He allowed as how he didn’t know how to handle a deposit, and she would have to use the machine in the lobby. I hope there were a dozen other people in the building at the time. I really do! 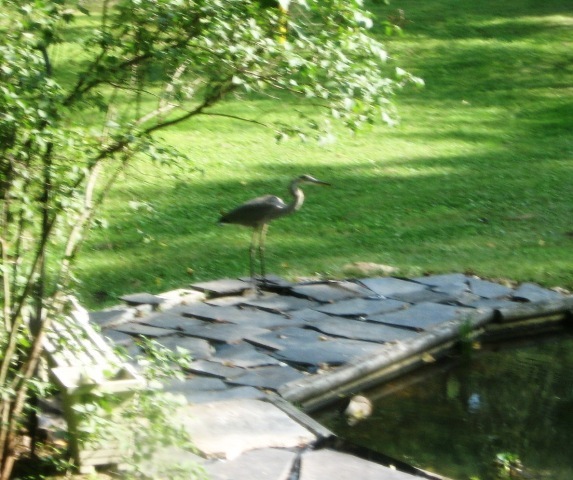 When I opened the bedroom curtains today, this Great Blue was standing on the patio, apparently surveying the breakfast menu in the pond. He stayed put long enough for me to dash downstairs and grab the camera and get this shot. It is a bit fuzzy because I took it through both the window glass and the screen. My computer sits right in front of the den window, so I can keep an eye on the various types of finches, butterflies, plain old birds, and hummingbirds which come to the feeders. We have two hummingbird feeders, and by some sort of common consent, one is used almost exclusively by the honey bees and the other by the birds. Given the dearth of honey bees lately, seeing so many jostling around the feeder is really nice. The hummingbirds move so quickly it is hard to tell what they are – definitely not Ruby Throated, so either Rufous or Calliope. Both have green backs and lighter undersides, but beyond that I can’t tell you anything. But they are really tanking up. We also have chickadees, which is really unusual for this time of year. Some of the oak trees are already dropping acorns – not green ones, but big fat brown ones, fully ripe. This is not normal for the first week of August, folks.